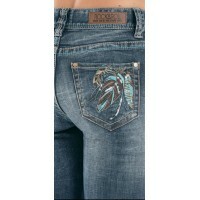 Extra stretch low rise boot cut in medium vintage wash with aztec multi color embroidery flap back pockets. Matching embroidery on coin pockets. Matching embroidery on coin pocket. 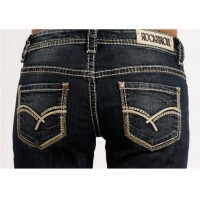 Front of jean and side seam. Khaki topstitching. Antique rose trims. Brown leather embossed e seam. Khaki topstitching. 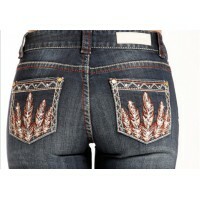 Extra stretch mid rise skinny in medium wash with heavy aztec embroidery on back pockets. Matching sideseam embroidery. Ivory topstitching. Brushed silver trims. Ivory embossed waistband label and hed silver trims. Extra Stretch Mid Rise Skinny Jeans dunkel gewaschen mit mehrfacher Stickerei und Khaki und beigen Details auf den hinteren Taschen. Mit Leder Label und Reissverschluss vorne. 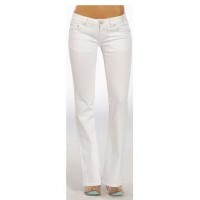 Riding boots cut in white denim with ivory embroidery details on back pockets. Ivory topstitching. Antique rose trims. Ivory embossed waistband label and zip fly. 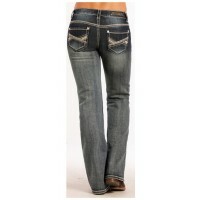 Bein Innenlänge: 34"Hüftumfang: 26" - 28" Bein Innenlänge: 36"Hüftumfang: 29" - 31"
Coolmax riding bootcut in dark vintage wash with crossing seams with embroidery on back pockets. Matching embroidery on yokes. Ivory topstitching. Brushed silver trim. black waistband label and zip fly. Bein Innenlänge: 34"Hüftumfang: 27" - 28" Bein Innenlänge: 36"Hüftumfang: 29" - 31"